Former Deputy Prime Minister Muhyiddin Yassin who supports former Prime Minister Dr Mahathir Mohamad, condemns Prime Minister Najib Razak on 916 Red Shirt Rally which was held in Kuala Lumpur on 16 September. 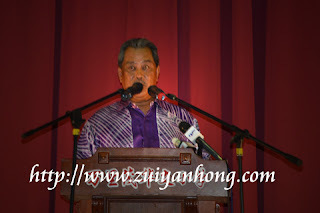 Muhyiddin Yassin insists that for the sake of national interest, MCA, MIC and Gerakan should dare to express their views to overcome the various complex problems that Malaysia is facing. He said as long as not lying and twisting, component parties of Barisan Nasional need to show their stand regarding 916 Red Shirt Rally. If leaders of MCA, MIC and Gerakan are worrying of being fired and remaining silence, they are not only reject by voters even affect the progress of the country. The Red Shirt group insulted the Chinese severely during the rally on 16 September. The Chinese based parties of Barisan Nasional have to against these extremists. If not, these parties must put on sarung and songkok to contest in constituency with majority of Malay voters. In such circumstance, MCA and Gerakan must change the name of the party for not eligible to represent the Chinese community. The intention of Muhyiddin Yassin is as clear as crystal, that's challenging MCA, MIC and Gerakan to decline Najib Razak.